Sculptor Walter Liff sizes up his creation, a weathervane in the form of a 15-foot-long codfish, as he applies gold leaf to the painted aluminum scales. 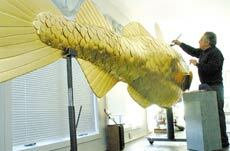 New Castle resident Walter Liff applies gold leaf covering his 15-foot-long codfish weathervane sculpture. Nicknamed Todd the Cod, the fish is 15 feet long, 3½ feet wide and 5 feet high. "That’s a big cod," Liff said, adding that it barely fits in his New Castle studio. The weathervane was "built like a ship" with a quarter-inch thick aluminum plate frame and an outer "skin" made of 16-gauge aluminum sheet "fish scales." These scales are now in the process of being plated with 24-karat gold leaf, the same type of gold used on capitol domes across the country. Below the fish are the four quadrants, standing 7 feet high, and two gold globes, one 8 inches and the other 12 inches high. The entire piece will be mounted on 12-foot, 3-inch-thick stainless steel pipe. To ensure the weathervane turns properly in the wind, Liff said he used machine bearings. 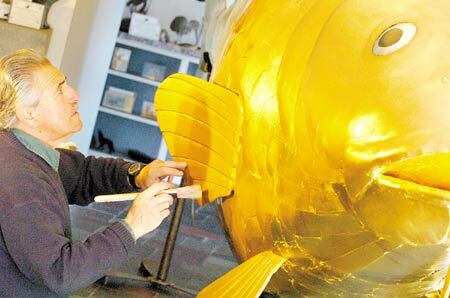 New Castle resident Walter Liff brushes away the visible seams between applications of gold leaf covering his 15-foot-long codfish weathervane sculpture. "I’ve always done seat-of-my pants engineering," Liff said, but this time around he asked the advice of a structural engineer before construction. "Once you put it up in the air, you can’t be worried about maintenance problems," Liff said. Liff said the weathervane must be big simply because the building on which it will sit is so large. To make a weathervane proportional to the structure, Liff said he had to make it 15 feet long. "Once you lift it 75, 100 feet in the air, you have to have something big enough," he said. But is it big enough to set a world record? Liff said he is fairly sure his is the largest, but he’s still waiting for confirmation. To apply, he had to answer questions over the Internet from the Guinness World organization, then fill out a 12-page application and licensing agreement. He has sent the application and request overseas, via registered mail, but said because Guinness receives 40,000 inquiries each year, his request may take a while. This may be the largest - but it is not the first - unique weathervane Liff has made. "I’ve been making weathervanes going on now about eight or nine years," he said. "There’s not too many people making individual, custom-made weathervanes anymore."